Home window tinting controls the sun to help you live in greater comfort. The sun can make certain rooms too hot or filled with glare and can ruin your expensive furniture and fade your hardwood floors. House window tinting puts the sun in its place to give you back those rooms to enjoy when you want. Plus you’ll save on cooling costs and protect your family from harmful UV rays while adding lasting value and beauty to your home. Residential window tinting with window films can lower heating and cooling expenses by reducing solar heat from the outside, reducing hot and cold spots inside, and helping to prohibit heat from escaping. Open your blinds, shades, or drapes and let the sunlight in! Window Tint reduces glare by up to 87%, making it easier for you to watch television or work on a computer. And because residential window tinting is available in a variety of clear, light and subtle shades, you’ll be able to enjoy your view. Window film helps preserve the color of fabrics, carpets and hardwood floors. Most fabrics, furnishings and artwork can be damaged and fade when sunlight passes through untreated windows. By blocking more than 99% of all UV rays, UV window film offers protection for the things you love and have special meaning to you. It will help preserve the color of fabrics, carpets and hardwood floors and help protect fine antiques, woods and works of art from discoloration and fading. UVA rays streaming through your home windows not only adversely affect your furnishings, but are damaging to your eyes and skin and may contribute to premature aging, and lead to skin cancer. With one out of five Americans developing skin cancer these days, why live with this risk? UV window film is designed to protect against harmful ultraviolet rays. It is a micro thin film that is transparent so you can enjoy the view without the UV. 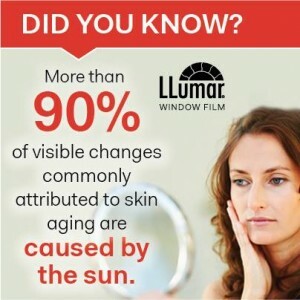 UV window film has been recommended by dermatologists as another skin safe preventative measure for patients with solar sensitivity, skin related diseases and cancers of the skin. We carry UV window films which carry The Skin Cancer Seal of Recommendation. The seal is awarded to products that protect against skin cancer, like sunscreens. Help change the odds for your family. Make UV window film part of your sun safety program. You can never be too safe. Accidents and storms can shatter windows without warning, sending flying shards of glass everywhere. It can result in severe injuries to your family and significant damage to your home. This risk can be dramatically reduced with safety and security window films. Safety and security window films meet the toughest industry standards in the United States, Europe and around the world, so you can trust that you’re using a product that works. And because it is optically clear, you won’t even know it’s there – until something happens. Think of it as insurance!